Enemy Overhaul focusing on enemy variation and hard boss battles. EnaiSiaion for Apocalypse and allowing anyone to use assets from it. He's done incredible, high quality work and it's made this mod more enjoyable. tjhm4 for Know Your Enemy which allows me to easily add a version of this mod that includes enemy resistances. Removed witch curse which was causing a CTD in Darklight Towers. No idea why. Removed all sound files for curse apply which was persisting through load doors. Fixed Draugr armor perk to scale to the draugr's level. Issue with Orchendor constantly teleporting should be fixed. It was an issue with the Warlock Combat Style. Removed On Hit Sound Effects for the curses. Extra Damage 3.5 added to 2-handed keeper to bring him in line with the others. Thanks to sabrio204 for reporting this. Carried over changes from ussep to bring this in line with it. There are still a couple conflicts but they are intentional and shouldn't cause any issues. Added Perks to bandits, draugr, forsworn, falmer to make them feel more distinct. Draugr have armor based on their level and thus what armor they appear to be wearing. 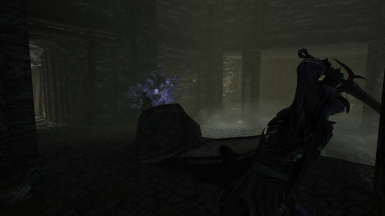 Falmer are invisible when in a dark area and reworked their poison. Added support enemies. Bandit mages will now be healers and will heal nearby allies. Forsworn shaman have aoe healing spells and a circle spell that increases forsworn attack speed. Witches now have multiple curses. 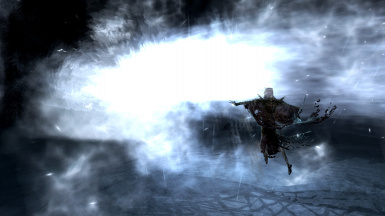 Gave dawnguard and Vigilant a perk to allow them to do much more damage to vampires. Fixed issue with Dremora Mage clothes. Fixed issue with high level bandits being set to wrong race. Gave ghosts a cold attack on hit. Removed disarm from generic draugr. Only a couple named bosses have access to it now. Changed shadow bolts damage from 50 to 35. Made a few changes to Harkon to hopefully resolve issues that have been reported. Changed casting time of a few spells so AI will properly use them. Changed Geirmund Sigdis Illusion arrow to use a new record instead of overwriting the vanilla one. Reduced duration of Krosis' Storm Call. Fixed the issue causing some of the wordwalls to give the player shouts designed for the NPCs to have. Fixed issue causing Witch's curse to stack rendering all weapon damage useless. Changed the skeletal summons that the dragon priests summon to use nord hero weapons instead of daedric. Moved to BSA Format because it's cleaner for the user and easier to manage for me. Added hailstone to necromancer adepts so they can appropriately combo with fracture. Added Shadow spells from Shadow Spell Package to Vokun to fit with his name and bring him up to par with the other dragon priests. Increased Hagraven unarmed damage and reach. Their damage up close was laughable. Added the conjure Herne Spell from Apocalypse to Hagravens to fit with their ties to the forsworn and mastery over magic. Removed Bombardment from Hagravens. Their use of it was not reliable and now they have shadow spells instead. Gave cultists new spells and made the conjurers prefer to conjure seekers. Increased Werebear speed and unarmed damage. Added Perks and shouts to miraak and made his level static. Added summons and Augment perks to Orchendor. Buffed the strong scattershock variant to be on par with sleet storm. Added stronger shouts to Red Eagle and fixed his template. Made Harkon's drain projectile stronger. Gave Drascua strong shadow spell. Made a few of the draugr bosses stronger and gave them cool new abilities. The Gauldursons will be pose much more of a threat. 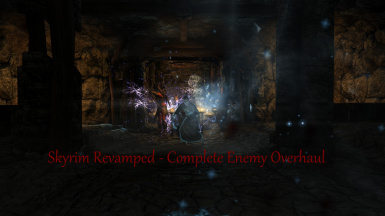 This mod is an overhaul of the game's enemy system. I've tried to increase difficulty by editing AI, spell preferences, and attack diversity. Enemies will be much more aggressive than vanilla and have the abilities to back it up. I wanted to keep the vanilla leveling so that it is compatible with Encounter Zone mods and mods that try to delevel the world. I've also created higher level enemy variants of the enemy types that I thought needed it. For instance, the Draugr's highest non-boss level variant in vanilla is 40. I've added two more variants going up to level 60. Many difficulty mods include Combat Style edits and this is no different. Enemies will be much more aggressive than vanilla and will not stand around. My edits are very similar to Wildcat and Combat evolved so if you have either installed, you should let this mod load after them. Some of the bosses rely on what I've done with their combat styles so if you let something overwrite them, the boss fight may not be as intended. It may not be too much of a difference but just to be safe. I've included and distributed spells from vanilla and Apocalypse to various enemies. I've made sure that they are all actually capable of using them and that they will use them in fights. They are mostly Destruction spells but also a few Conjuration. I've given many enemies access to Vanilla perks. 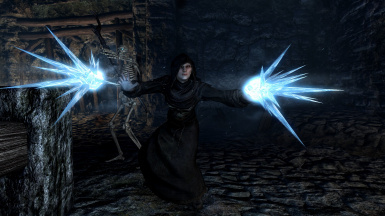 For mages, I've given them the ability to dual cast and given them various conjuration and destruction perks. This part of the mod will benefit from having Ordinator installed. Ordinator distributes it's perks by changing the perks from vanilla that NPCs already had. For example, if an enemy has the first level of the augmented flames perk, with ordinator installed they would actually be given level 1 conflagration and level 1 Scarring Burns from Ordinator. Some enemies in vanilla already have these perks but many don't. 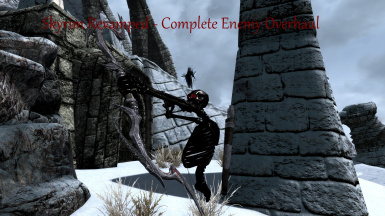 This mod adds them to enemies that qualify for them and that it makes sense for them to have. If you don't have Ordinator installed, it will still give vanilla perks to these enemies but Ordinator makes the perks enemies have more interesting. I still wanted bandits to be the easiest enemies in the game. I've not done too much here except add 2 higher level variants. They will be more difficult because of the Combat Styles. Forsworn will have some of the most raw physical damage. I've added many perks as they qualify and given the mages access to new spells. All draugr variants will now have different shouts available to them and they will use them as often as they can. I've mostly kept creatures the same. I've given them more damage and health. Trolls regenerate health very quickly and gargoyles will do much more damage. I've also made the poison from chaurus and frostbite spiders much more dangerous. Falmer will poison, slow, and debuff you. They should pose a much higher challenge. 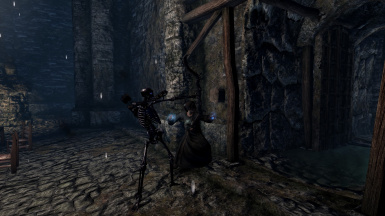 Between Falmer, Chaurus, and spiders, the resist and cure poison magic effect have become much more significant. I've improved the spriggans concentration spell, given witches and Hagravens spells from Shadow Spell Package. Dwarven sphere's will prefer to use their crossbow and the bolts will pierce your armor. The shock attack from the spiders will hurt more and Centurions will bludgeon your armor and knock you down. Necromancers and Conjurers will actually prefer to use conjurations over destruction. This means they will summon and then start to attack. Mages have access to new spells and perks. They will dual cast. This alone increases their difficulty by a decent amount. I've tried to make vampires the strongest enemy. I've given them a short invisibility and increased their movement speed and damage. Their melee attacks will hurt significantly. I've overhauled most bosses in the game. No longer will the named dragon priests or the bosses of various quests be pushovers. They've been given the most powerful new spells and many perks. They should provide fun, fresh experiences. 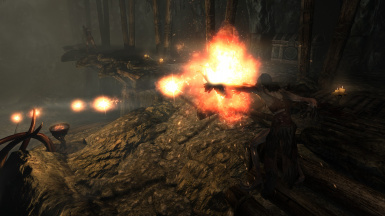 Apocalypse- Magic of Skyrim: This will give you access to the same spells that enemies will now posses and much more. Great spell package. Know Your Enemy: Great resistance overhaul to give enemies even more diversity. I've included a patch for the mod. Skyrim Revamped﻿: My leveled list and Encounter Zone overhaul. This mod will make fighting the enemies worth it. It makes the chests at the end of dungeons much more worthwhile and the Encounter Zones are built with this mod in mind. Shadow Spell Package﻿: This will give you access to the same shadow spells the witches and hagravens have. EnaiSiaion for allowing anyone to use his spells. He's done incredible, high quality work and it's made this mod more enjoyable. TenebKel for allowing me to use assets from his mod and helping out with some questions I had. UNI00SL for Vanilla Followers AI which I used and tweaked to get enemies to use support spells on their allies.